People stand beside a building as the sun sets over Whiteclay. Many of those who spend time drinking on the streets in Whiteclay spend their nights in a makeshift camp not far from the town. Eleven students in the University of Nebraska-Lincoln's College of Journalism and Mass Communications took home the grand prize at the Robert F. Kennedy Journalism Awards ceremony May 23 in Washington, D.C. It was the first time in the event's 49-year history that the top prize went to a college group. Other division winners included National Geographic, The New Yorker, HBO and Univision. The students won for their depth reporting project "The Wounds of Whiteclay: Nebraska's Shameful Legacy," which delved into the issues and impact of alcohol sales in the small community of Whiteclay. 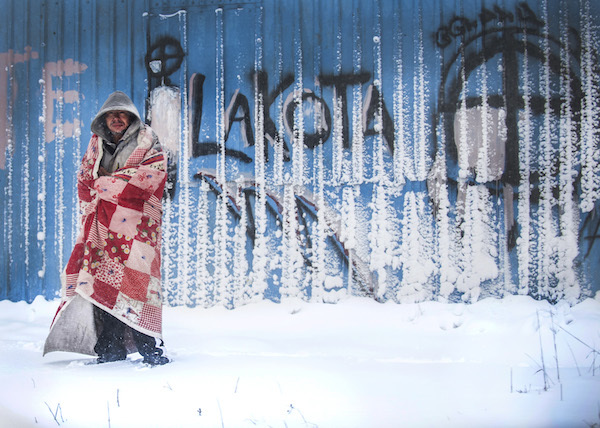 "These students spent hundreds of hours over the last nine months exploring and exposing the multitude of issues surrounding Whiteclay," said Joe Starita, professor in the journalism college and an editor of the project. "This is an exceptional feat of journalism at any level, and the resulting package is one in which every Nebraska taxpayer got their money's worth." Chris Bowling, a senior journalism major who was a reporter and graphic designer on the depth report, said it was "absolutely insane" to be recognized in a room full of journalists passionate about human rights issues. "These are journalists we look up to and aspire to be like," he said. The undergraduate students explored and reported on the many issues surrounding beer stores in Whiteclay – a village of seven residents that sells about 3.5 million cans of beer annually to residents of South Dakota's nearby Pine Ridge Reservation. The report showcased the students' stories, photos and video on a website that has been cited for journalistic excellence in The New York Times, Esquire magazine and the Economist. The coverage played a role in the Nebraska Liquor Control Commission's discussions and two-day hearing on alcohol sales in Whiteclay. In late April, the commission voted to revoke liquor licenses assigned to the four stores. Those stores stopped selling alcohol on April 30. The ruling is being appealed in Nebraska courts. "The Wounds of Whiteclay" explores the issues surrounding alcohol sales in the tiny community of Whiteclay, near South Dakota's Pine Ridge Reservation. Bill Frakes, a visiting professor in the journalism college and the project's visual editor, said this was one of the most talented groups of students with whom he has worked. He said the report required a serious commitment from students, who made the 830-mile round trip between Lincoln and Whiteclay numerous times and devoted countless hours to reporting, shooting, editing and designing. The bulk of the work had to be done on site, he said, and sometimes in difficult weather conditions. "This award was a testament to not only the talent and skill of these kids, but to how hard they worked," he said. Frakes said he hopes the project results in good solutions for the people of the area. "As journalists, it was our job to shine a bright light on the situation," he said. "Now it's up to the courts and the Legislature to take care of what they need to take care of." Bowling said that even though the beer stores have stopped selling alcohol, it's important for people to continue to pay attention to Whiteclay and the Pine Ridge Reservation. After 100-plus years of problems, he said, the healing has just begun. He said the award was especially meaningful because journalism seems to be at a crossroads. "This showed that when you're faced with obstacles, you get through them with harder work, more perseverance and more attentiveness to the truth," he said. Other contributors to the project were reporters Lauren Brown-Hulme, Vanessa Daves, Marcella Mercer, Alyssa Mae and Natasha Rausch; photographers Amber Baesler, Jake Crandall, Calla Kessler and James Wooldridge; and website designer Matt Hanson. Additional editors were Roger Holmes, research assistant; and Rebekka Herrera-Schlichting, project coordinator. 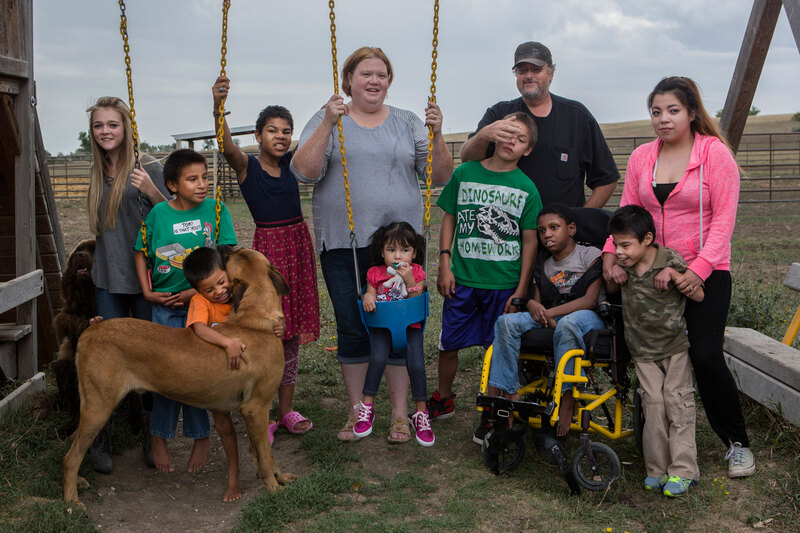 Nora and Randy Boesem have adopted 12 children suffering from fetal alcohol spectrum disorder. Since 2001, the Boesems have taken in more than 100 foster children. Boesem family members pictured are (from left) Rachel (15), Jeremy (10), Mark (4), Frannie (12), Nora, Dontae (14), Randy, Kayleigh (10), A.J. (10), Michelle (15) and Arianna (5) in the middle. Not pictured is Vincent (24), the late baby Justice and the late Donovan.